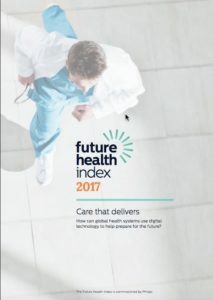 Again this year I was thrilled to be invited by Philips to participate in their Future Health Index project. This is among the most visionary annual healthcare overviews in the world. The full report – a 100 page PDF – is available free here. Each year they’ve also asked me to submit a post for the project’s blog. Here’s my submission this year, touching on why oncology is ahead of most specialties in this area: the field decided years ago to align for patient benefit! Let’s all do everything we can to help healthcare achieve its potential! Sharing information is part of that. Decade after decade, innovations change the future of care. Microbes, anesthesia, surgery, transfusions, public health, radiology, penicillin, genomics … each development produced a quantum shift in what clinicians can achieve and in patients’ lives. I wrote an article for the Future Health Index last year, Could data make you live longer?, which lists six different ways I as a patient can be empowered by better data flow. Similarly, it turns out one of medicine’s next great frontiers is not biological but technological: the ability for clinicians to share relevant patient data with others. In this innovation, oncology is ahead of other specialties: the 2016 Future Health Index report found that 71% of oncologists across 13 countries share patient data electronically, while only 63% of other clinicians do. Why? What can we learn from this? A big factor is that oncology as a profession decided nearly a decade ago that electronic data sharing is core to their work, and spoke up about what they need. Third in a series of retrospective posts, reviewing the ten years since my cancer and how my shifting perspective has altered what I’ll be doing from now on. I’m generally doing one post per year, but so much happened in 2009 that it’ll take several. By the way, I added new items on my 2008 entry – things that later became important: an award I got for using data in my day job, and meeting @TedEytan. At the annual “friends of Tom” retreat (Doc Tom’s friends) that I mentioned last time, that gang of crazies decided the time had come to become a medical society. In addition to deciding on a mission (patient-clinician partnerships) they talked about officers, and said “It won’t do to have this society run only by doctors, of course.” I think it was Gilles Frydman (founder of ACOR, where my patient community lived) who said it had to be a doctor-patient team. They looked around and pointed to the only pair in the room – Danny and me – and said we should be co-chairs. I’m a health data nudist: I don’t care who sees my “privates,” if doing so furthers the cause. And the time has come to push the issue, because my hospital is stonewalling, and that is just so not okay: as comments on my previous post show, this truly impedes care. And that must stop. To end any mysteries about the much-touted PatientSite portal, in all its 1990s glory, I’ve decided to publish a complete 15-minute walk-through of everything in my chart, when I’m logged in PatientSite at Beth Israel Deaconess, the hospital that magnificently saved my life ten years ago. Dear John: I still want to download my records! Gimme My DaM Data! 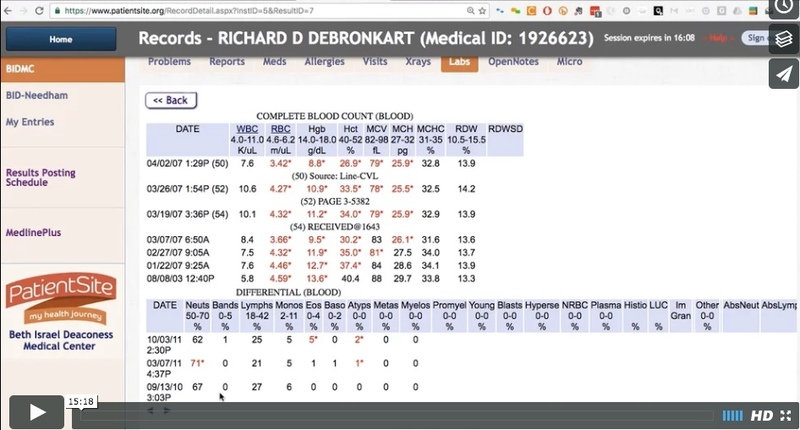 Let us start by reviewing our anthem: “Gimme My DaM Data – it’s all about me so it’s mine,” by the magnificent Ross Martin MD and his wife Kym, multi-cancer patient whose care has been affected by lack of access to her health data. “DaM” is Data About Me, Kym’s more-polite version of my cussing. Read on for why this is newly urgent. Dear John: *I* want to download my records. I want to download all my data from my 14 years as a patient at Beth Israel Deaconess Medical Center. What button should I push? 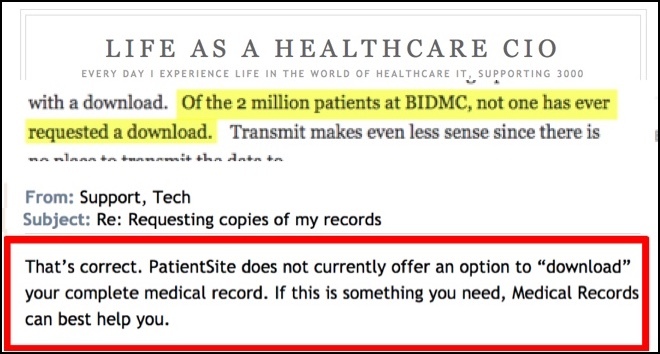 In June you said on your blog (left, top) and on MedCity News that no patient has ever asked for that, but your tech support says you don’t have a way to do it (see red outline). Tech Support said I should call Medical Records. I did, and they said they can’t deliver things electronically. So where is the link you say nobody has ever used? “It was twenty years ago today / Sgt Pepper taught the band to play” … well, today’s the 20th birthday of Seinfeld episode #139, October 17, 1996. This was the famous segment where Elaine looked in her chart and found she’d been marked “Difficult.” What followed was hysterical, as she got lied to and ultimately recruited Kramer to impersonate a doctor (“Doctor Van Nostrum”) to get her records. You see, when this episode aired, Elaine did not have the right to see her chart. The HIPAA law had been passed in August 1996 by the legislative branch, but the regulations giving her access rights had not been created yet by the executive branch. Well, things have changed, and change can be good … and in a delicious twist, the OpenNotes people got me to impersonate Kramer impersonating a doctor, in a new video mashup. Enjoy.